In order to build a strong, stable house you must first have a strong, stable foundation. The same can be said that building a strong, stable skeletal system needs a strong, stable pedal (foot) foundation. Your feet do a lot for you every day. They allow you to walk from one place to another, they help you to stand, they allow you to run and jump. If they are treated right they will do all you ask for a long time without complaints. Ahhhhh… BUT treat them wrong and look out! Put them in tight ill-fitting shoes, kick things with them like footballs, soccer balls, even people, jump on them while playing basketball or volleyball, use them to stomp on things as when digging a hole with a shovel or stomping down soil around a newly planted shrub and sooner or later they will let you know about how you make them feel. Your feet have three arches that need to be supported properly and consistently. These arches, if maintained properly, will absorb shock and help to provide spring in your step and in your jump. The arches also allow your toes to point straight ahead (prevents bunion formation) and extend with each step (prevents hammer toe). Shopping at any shoe store you will see a plethora of shoe styles, shapes and functions. Some have straps, some laces, some Velcro, some elastic. Some are flat inside, some have arches built in, some are cushioned, others hard as rock. Everyone tries on different shoes/sneakers that they like, to see if they ”fit” . In most cases they will buy the style they like and what “fits” them. They may “fit” them but they may not support them properly. They will also own different shoes that fit them but these too may not support them. Supporting them means to provide proper support of the three arches of the foot and consistent support so that each shoe they wear provides the same correct support. Custom made orthotics are inserts made for your shoes/sneakers that are made to correct improper foot alignment thereby reducing the strain on the feet, toes, arches and all the way up the kinetic chain (knees, hips and spine). Custom made orthotics are used to decrease the effects of and prevent formation of bunions, hammer toes, plantar fascitis, corns, calluses and also helps reduce ankle and knee sprains. Custom made orthotics are fitted for each person, they can be moved from one shoe/sneaker to another essentially making each shoe you have, become custom fitted. They can be made for men’s or women’s shoes with materials that help regulate foot temperature and wetness. They are also made for specialty purposes such as golfers, arthritics and children. 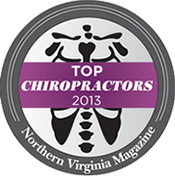 Call our Fairfax chiropractic office today!